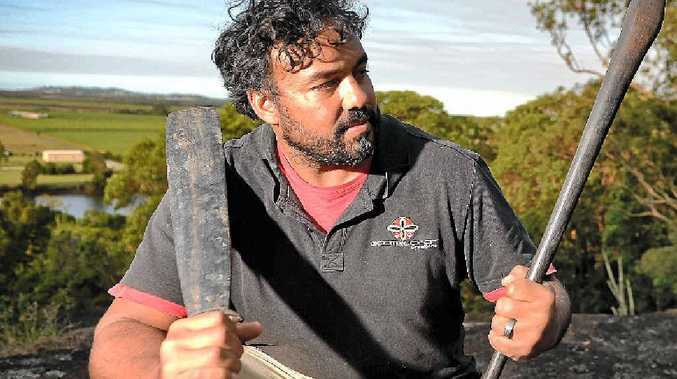 A PRICELESS collection of weaponry and other artefacts that could have been lost forever will provide a window on the Sunshine Coast's Aboriginal heritage in the future. A total of 52 artefacts that had been sitting in a shed for 100 years have been handed back to the local Gubbi Gubbi/Kabi Kabi tribe. The collection includes spears, boomerangs, clubs and other items used by Gubbi Gubbi/Kabi Kabi people, as well as items from South Sea Islands and Papua New Guinea including tools made out of human leg bone. Glasshouse resident Grant "Tank" Shaw initiated the handback after he was approached six years ago by Montville resident Margaret Newson, when he was working at Beerwah State High School. "She was looking for someone to give them back to the Kabi Kabi. She didn't want them in a museum," he said. An Aboriginal man from Tasmania, Tank was excited when he saw the size and significance of the collection. "After me being up there and getting quite excited about the stuff we'd found, she asked if I would be a custodian of then and take them back to their rightful owners," he said. Mrs Newson was a former Nambour resident and the second wife of the late John Newson. Mr Newson's first wife was Butteress Lowe, whose pioneering family was understood to be part of the first wave of European settlement in Nambour. The artefacts had been wrapped in blankets and stored in a shed by John Newson, who died in 1989, and were thought to have been in the possession of the Lowe family since 1888. Tank said Mrs Newson had told him the Lowe family did mission work in Papua New Guinea, which is how they might have come across the PNG artefacts. Kabi Kabi man Kerry Neill said he was speechless when Tank decided to hand over custodianship of the collection. PADDLES: Grant ’Tank’ Shaw, who found a home for the historic items. "They (the artefacts) would have been brought over by the blackbirders who stole all the people and brought them over to work on the cane fields," said Mr Neill, whose own ancestors were among them. "There's no words I can say to thank him for passing them on. "Because they belong to the Kabi Kabi people, I'm going to keep them and make sure they're looked after properly, so people can share and experience (them)." Mr Neill said a Brisbane-based valuer had explained the purpose of some of the items, and the Queensland Museum had registered the collection. The artefacts included "bargandu" which Mr Neill said were "killer boomerangs", as well as paddles from the South Sea Islands. 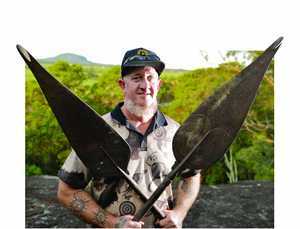 Some Islander tools with a more grisly purpose were also included - a headhunting axe, for example, that would have been used in wars to "chop peoples' heads off", Mr Neill said. "It's amazing. You've got to see them to believe them," he said. "There's human leg bones. No joke, man." Mr Neill planned to use the artefacts in cultural education projects, and said some may also be on public display in Nambour in the future. "They'll be used to show students (about) traditional life and what implements were used, how they were used and who made them," he said. He said the artefacts were a symbol of resilience for his community and a reminder of the past. "By Tank passing them on, it ensures that these ideas from the past can be put into practice in the future. "It gives not only Kabi Kabi people but our children a ... window into what our ancestors used to use," he said. "It's a reminder of the stories that have been passed on and it inspires us to ensure that we keep re-telling those stories." Do you know how the Lowe family came across these artefacts? 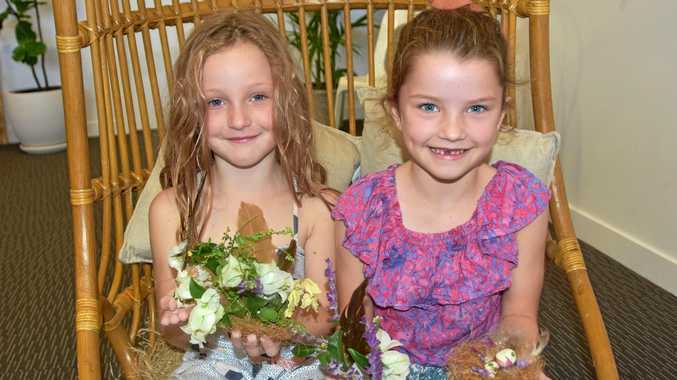 Do you have a story about the Sunshine Coast's past to share?